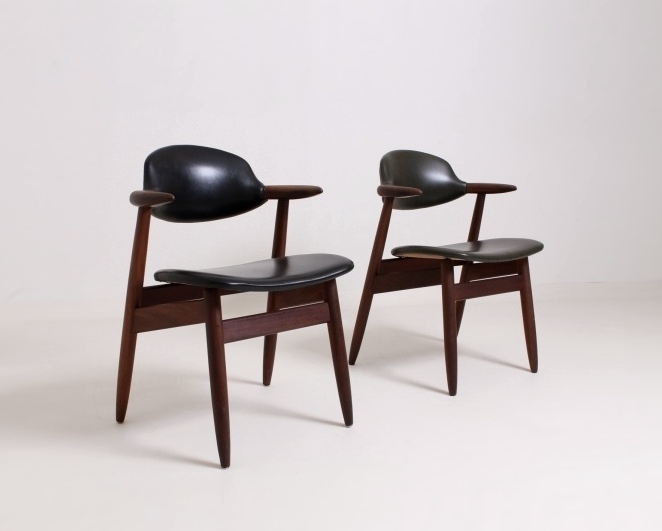 I scored a pair of these fantastic Mid Century Danish chairs for only $5 a piece (complete with a made in Denmark inscription)! I still don't know where exactly I want to put them, but I knew I couldn't pass them up. They sat in my "I-may-need-this-one-day" pile for almost a year before I decided to finally tackle the project. 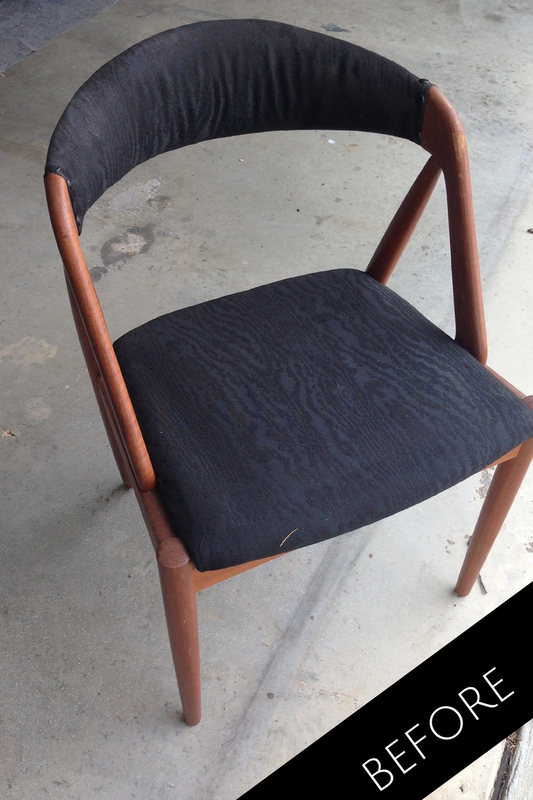 They actually weren't in that bad of shape - minor scratches all over the body of the chair and a horrendous all black wood-grain patterned iridescent fabric. 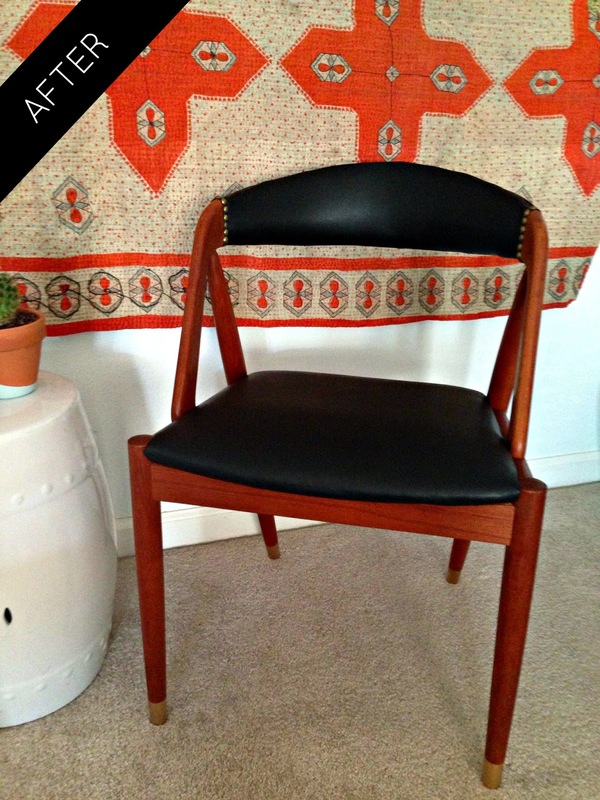 I decided to keep the look clean and traditional by simply restoring the natural wood color (rather than staining) and upholstering with black vinyl leather-looking fabric. I found some fabric in the sale section of Joann's that was the perfect mix of the real-leather look with a buttery soft texture (sorry I didn't catch the name). Keep in mind that the top parts are covered by the seat, so they are a little more beat up and I also didn't bother trying to make them look pretty. The after pic looks a lot more red, but it must just be the lighting. 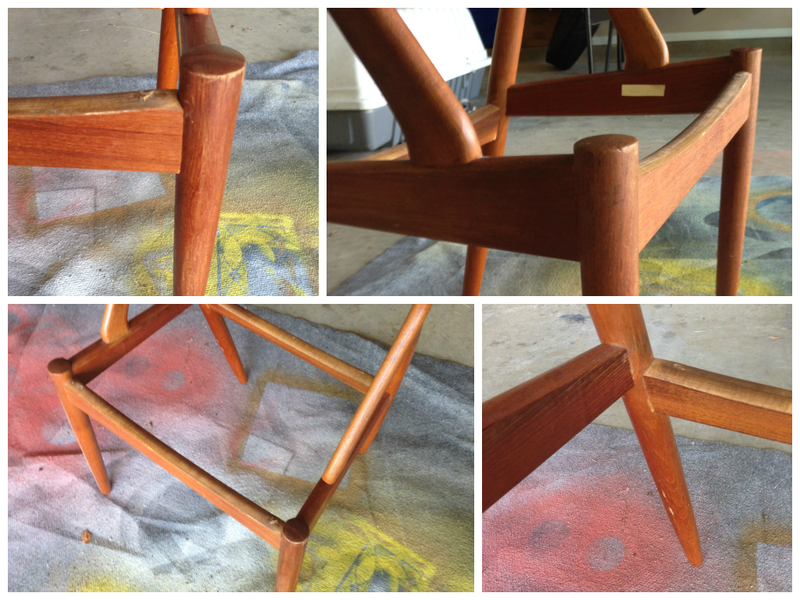 The oil/vinegar duo did darken and brighten the wood up but these color change isn't as drastic in person. The seat cushions were in great shape, so I didn't need to add any extra padding. I will skip the details on recovering the seat as it's pretty straight-forward and most of you have already seen it (or done it) a million times. To cover the backrest, I carefully examined the way it was originally done and tried my best to mimic that, but ultimately I couldn't get the backrest done perfectly enough for the OCD person in me, so I got some help with this part. Looks like the issue was the fabric I chose made it hard to tuck without any puckering. We went with two pieces, piping, and nail-head trim on the edges. If you don't already know, I'm obsessed with painting things gold, so it should come as no surprise that I thought these chairs could use a little bit of gold accents. 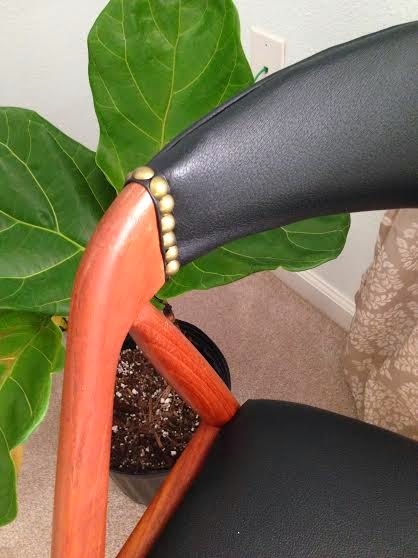 After scouring some pictures, I noticed that a lot of mid-century chairs had little gold caps on the legs. This gave me the inspiration to dip the tips of the chair legs gold. I tested it out by painting some painters tape gold, and then putting it on the chairs to see if I liked the look. Of course I did. So then I measured the perfect height (2 in) and taped off each leg with painters tape. I used a foam brush and liquid gold leaf to paint the feet. 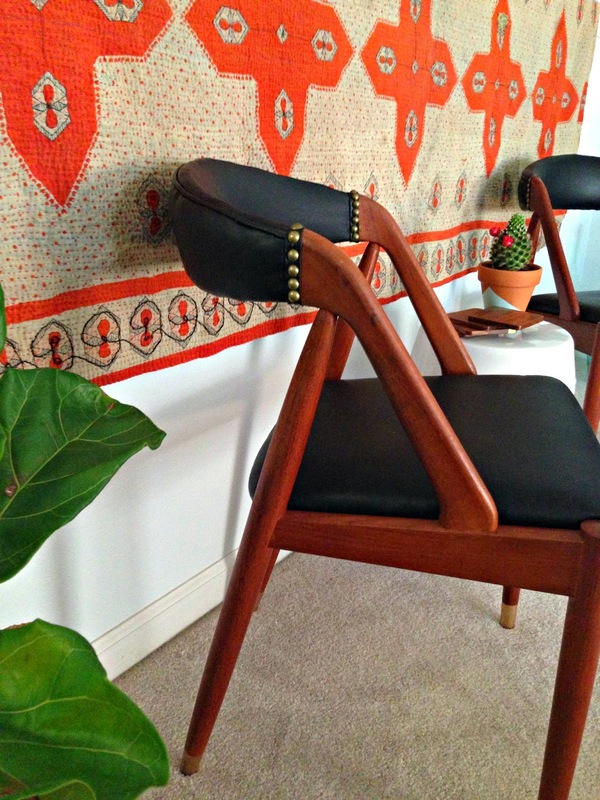 Aside from the backrest, this project is definitely fit for beginners. Part of me wishes I had done something more exciting, but ultimately I decided that drastically changing such a classic piece was something I may regret. Who knows, maybe one day I will go wild with some bright paint and patterned fabric! I cannot even look at all of the pictures of Mira without utter amazement at her ability to create the perfect fashion ensemble EVERY FREAKIN' TIME! The current freelance writer/humanitarian/creator of the fashion site Buro 24/7 and former Fashion Editor at Harper's Bazaar Russia, has been one of my (and the entire fashion world's) style icon for many years. Follow her on Instagram HERE and keep on scrolling to Steal Her Style! Even while pregnant she is killing it! 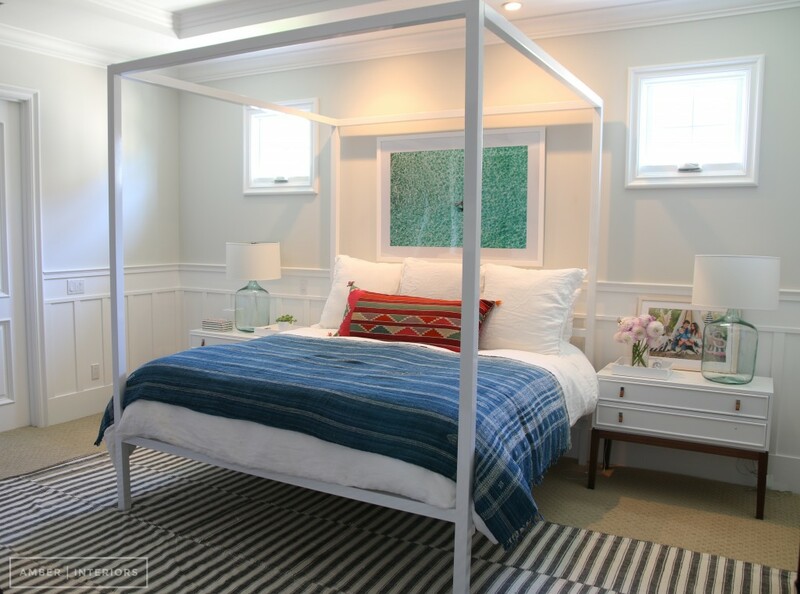 One of my all-time favorite interior designers turned blogger is Amber Lewis from Amber Interiors. 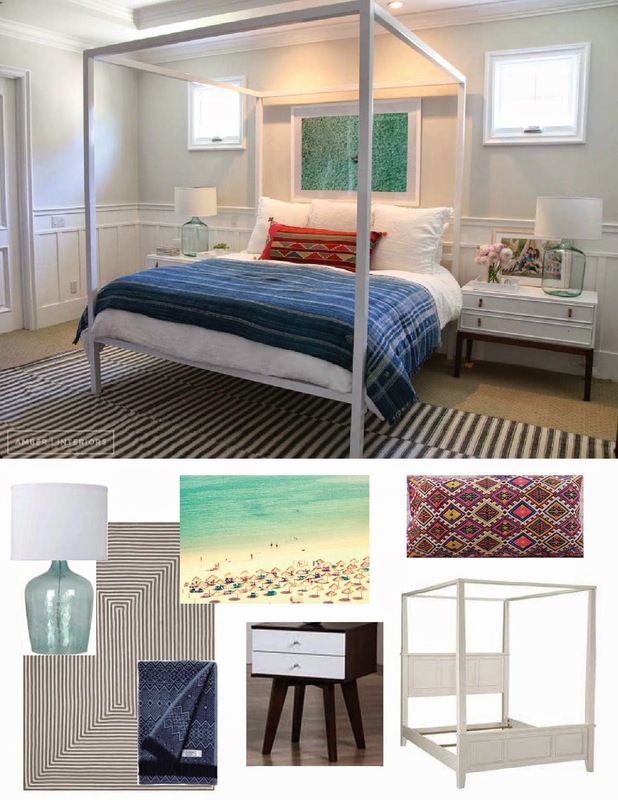 Her designs are the perfect mix of worldly traveler and beach bungalow. 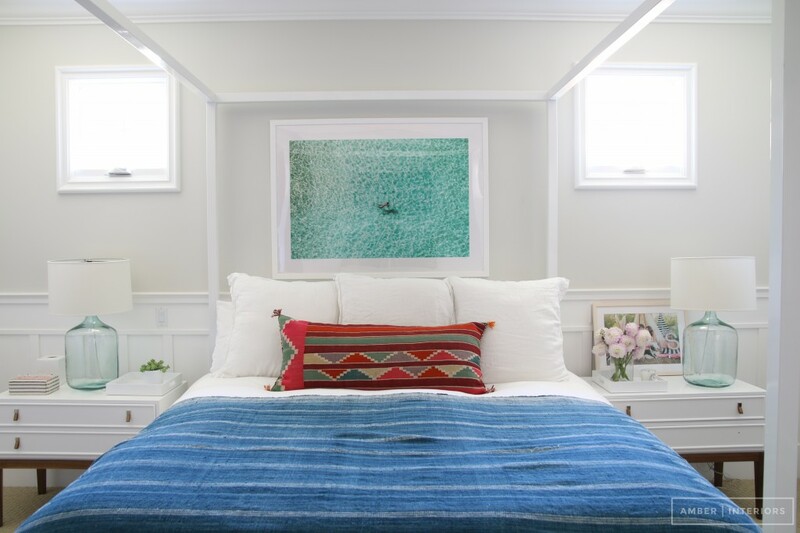 She is always starting new trends or is at least one of the first to know about them - heck if you told me that she was the sole starter of the kilim rug trend in the U.S. (see her genius rug layering HERE), I would not doubt you for one second. It doesn't hurt that her personal style and writing has that cool-girl-without-trying vibe. 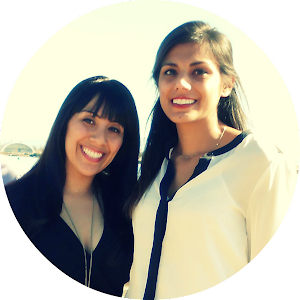 Amber recently gifted her readers a full before & after of her Client Awesome's house. The entire house is beautiful, but what caught my eye was the master bedroom. It is so crisp, clean, serene, and totally livable. I just want to jump into that bed and take a nap. 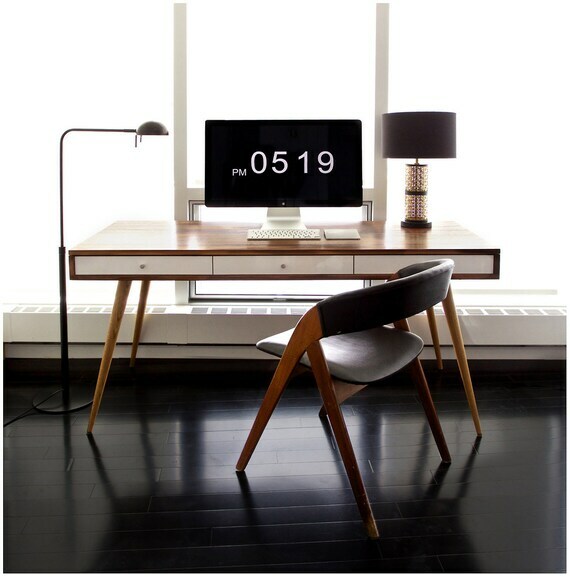 As one who DESPISES clutter, I appreciate the minimalism. I believe the actual bed Amber used was the Ikea Edland (sadly discontinued). 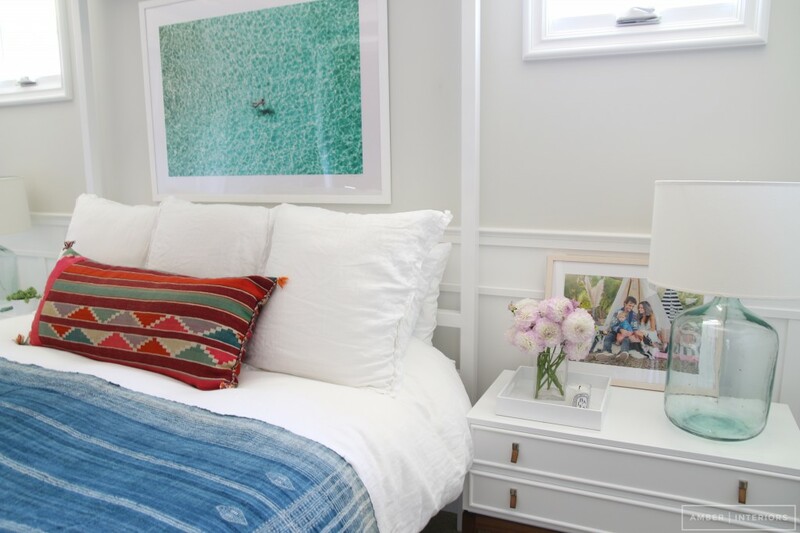 If you want to replicate the look I would first try scouring your local Craigslist for the Ikea bed which retailed around $300. 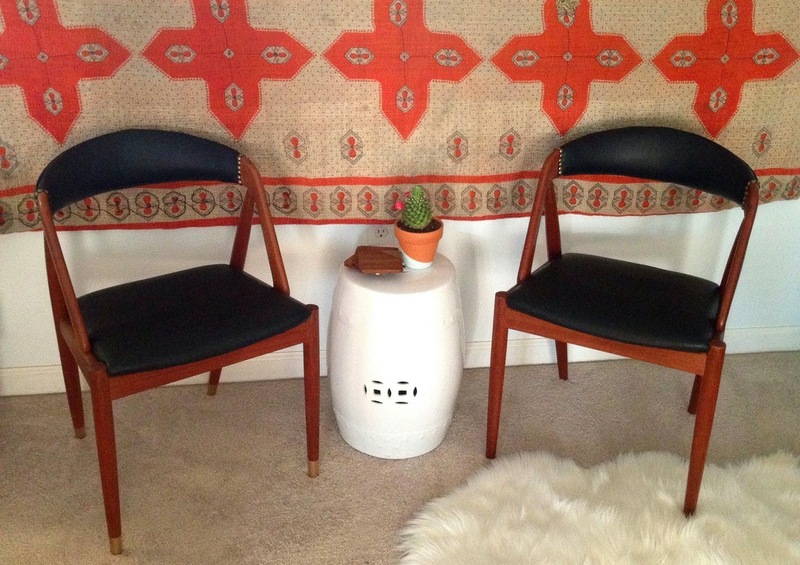 As for the kilim pillow, I often find that Ebay is much cheaper, but requires a bit more digging. I would definitely recommend searching around for a great price. 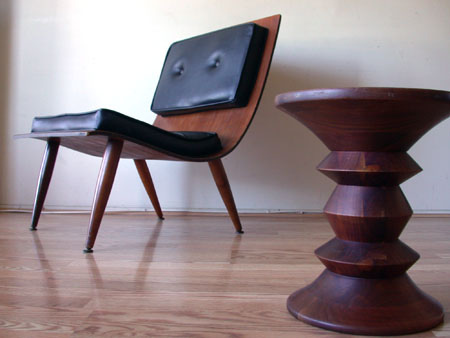 The nightstand would also make a great DIY project if you find a sturdy garage sale piece. Need some help deciding what to do this weekend? 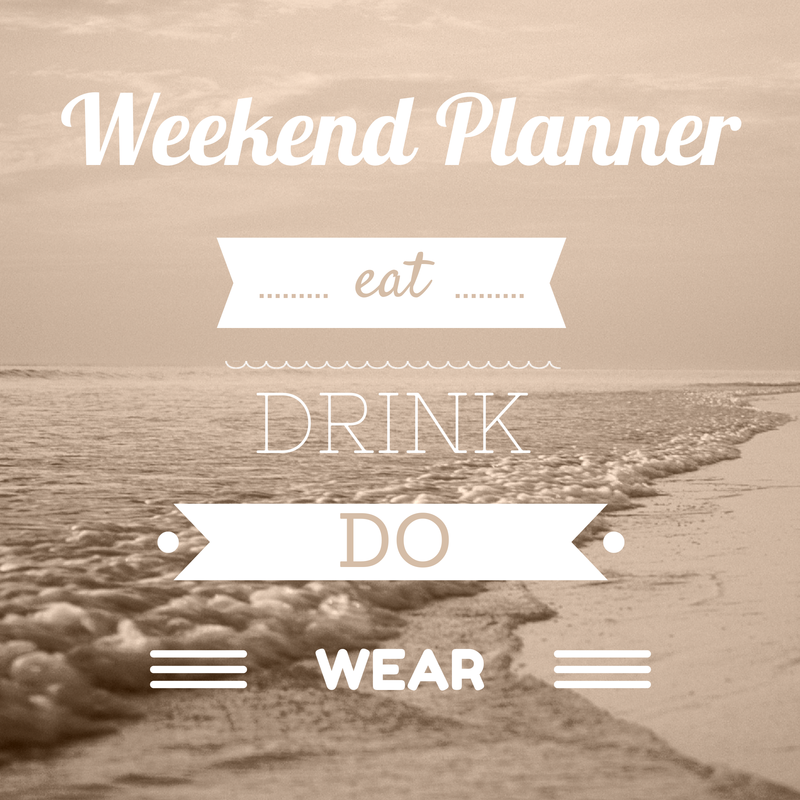 Check out some of these fun ideas on what to eat, drink, do, and wear this weekend. 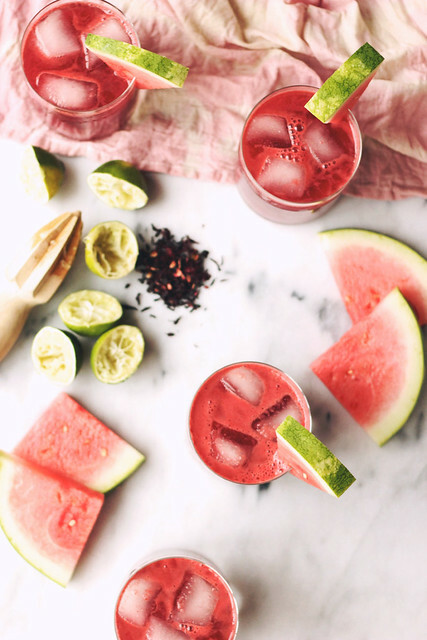 An amazingly refreshing Watermelon Hibiscus Lime Cooler from Tasty Yummies. Make this lightweight Summer Pom Pom Throw via Sugar&Cloth and go on a picnic.